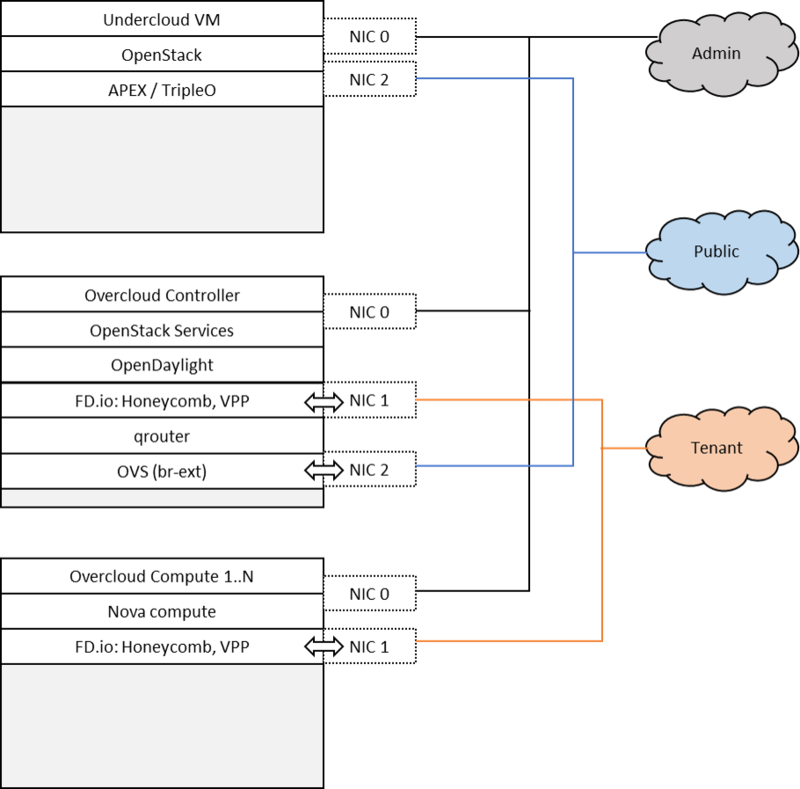 Scenario: “OpenStack - Opendaylight (L2) - FD.io” (apex-os-odl_l2-fdio-noha) is a scenario developed as part of the FastDataStacks OPNFV project. Layer 3 connectivitiy for tenant networks supplied centrally on the Control node through standard OpenStack mechanisms. All layer 3 features apply, including floating IPs (i.e. NAT) and security groups. The apex-os-odl_l2-fdio-noha scenario combines components from three key open source projects: OpenStack, OpenDaylight, and Fast Data (FD.io). The key components that realize the apex-os-odl_l2-fdio-noha scenario and which differ from a regular, OVS-based scenario, are the OpenStack ML2 OpenDaylight plugin, OpenDaylight Neutron Northbound, OpenDaylight Group Based Policy, OpenDaylight Virtual Bridge Domain Manager, FD.io Honeycomb management agent and FD.io Vector Packet Processor (VPP). Openstack Neutron ML2 ODL Plugin: Handles Neutron data base synchronization and interaction with the southbound Openstack controller using HTTP. OpenDaylight Neutron Nothbound & Neutron MD-SAL Entry Store: Presents a Neutron (v2) extended HTTP API servlet for interaction with Openstack Neutron. It validates and stores the received Neutron data in the MD-SAL data store against the Neutron yang model driven. OpenDaylight Neutron Mapper: The Neutron Mapper listens to Neutron data change events and is responsible for using Neutron data in creating Group Based Policy Data objects, e.g. GBP End-Points, Flood-Domains. A GBP End Point represents a specific NFV/VM port and its identity as derived from a Neutron Port. The mapped data is stored using the GBP End Point yang model and an association between the GBP End-Point and its Neutron object is maintained in the Neutron-GBP map. OpenDaylight Group Based Policy (GBP) Entities store: Stores for the GBP data artifacts against the GBP YANG schemas. Neutron Group Based Policy Map store: Stores the bi-lateral relation between an End-Point and its corresponding Neutron object. Neutron-GBP map; keyed by Neutron object type, port, and Neutron UUID, gives the GBP End-Point, Flood domain respectively. GBP-Neutron map keyed by GBP object type, end-point. Neutron VPP Renderer Mapper: The Neutron VPP Renderer Mapper listens to Neutron Store data change events, as well as being able to access directly the store, and is responsible for converting Neutron data specifically required to render a VPP node configuration with a given End Point, e.g. the virtual host interface name assigned to a vhostuser socket.. The mapped data is stored in the VPP info data store. VPP Info Store: Stores VPP specific information regarding End-Points, Flood domains with VLAN, etc. GBP Renderer Manager: The GBP Renderer Manager is the central point for dispatching of data to specific device renderers. It uses the information derived from the GBP end-point and its topology entries to dispatch the task of configuration to a specific device renderer by writing a renderer policy configuration into the registered renderer’s policy store. The renderer manager also monitors, by being a data change listener on the VPP Renderer Policy States, for any errors in the application of a rendered configuration. Renderer Policy Config Store: The store’s schema serves as the API between the Renderer Manager and specific Renderers like the VPP Renderer. 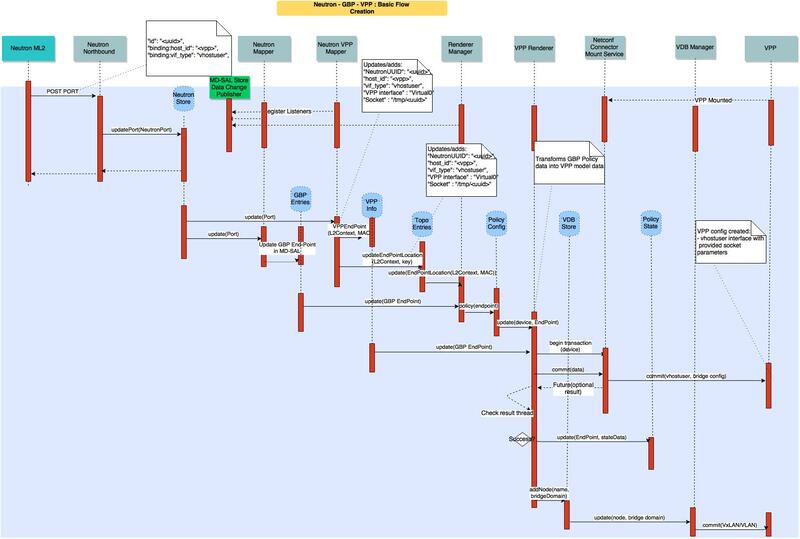 The store uses a a YANG modeled schema to represent all end-point and associated GBP policy data. Topology Entries Store: The yang model based MD-SAL topology store serves two fundamental roles: 1. It maintains a topological representation of the GBP End Points, in the context of customer networks. 2. It maintains an association of each (VPP) compute node’s physical interfaces to their neutron provider network (e.g. The association between an ethernet interface and a Neutron provider network). port or traffic filtering configuration, in accordance with the GBP policy. The VPP Renderer also interacts with the Virtual Bridge Domain Service, by means of the VBD store, in order to establish connectivity between VPP nodes in a bridge domain. For this it uses the VPP device name, and the flood domain data derived from the VPP Info and End-Point data respectively. For the executed configuration operations it updates state in the Renderer policy state store. Virtual Bridge Domain (VBD) Store and Manager: The virtual bridge domain manager is responsible for configuring the VxLAN overlay tunnel infrastructure to arrive at a desired bridged topology between multiple (VPP) compute nodes. VDB configures VXLAN tunnels always into a full-mesh with split-horizon group forwarding applied on any domain facing tunnel interface (i.e. forwarding behavior will be that used for VPLS). NETCONF Mount Point Service & Connector: Collectively referred to as Netconf Services, provide the NETCONF interface for accessing VPP configuration and operational data stores that are represented as NETCONF mounts. Rendered Policy State Store: Stores data regarding the execution of operations performed by a given renderer. The picture below show a basic end to end call flow for creating a Neutron vhostuser port on VPP using a GBP renderer. It showcases how the different component described above interact. To enable the “apex-os-odl_l2-fdio-noha” scenario check the appropriate settings in the APEX configuration files. Those are typically found in /etc/opnfv-apex.